The living room didn’t look too bad to begin with, really. It just needed some color and a little decorating to perk things up. I love that they kept the original phone nook! You don’t see those much any more, do you? Laurel says, “This was one of the biggest projects we’ve ever done, and it was a bit stressful at times. But somehow I forget about all of that once the project is complete . . . funny how that happens. 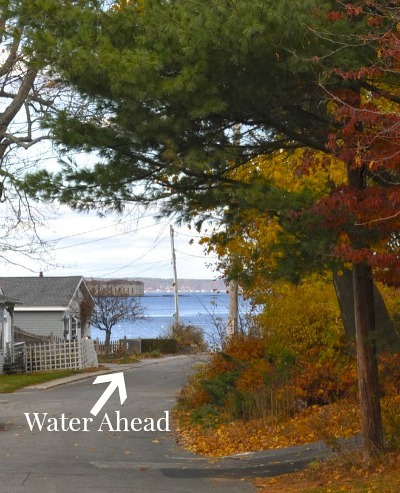 I can’t wait for the new owners to start living there and enjoying the space!” Check her blog SoPo Cottage for all the photos and details, including floorplans. 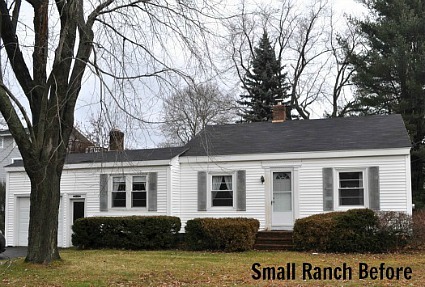 See how that small ranch looks now! What a fabulous transformation! There is not one thing that I don’t love! Thanks for sharing! Wow . 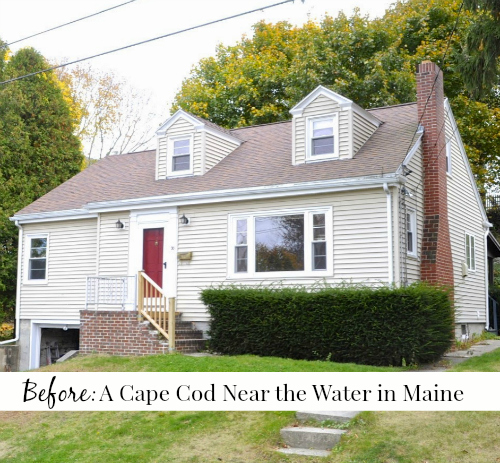 . . we came so close to buying our own cape cod! Those are super quaint but super tiny — these peeps have done a swell job. 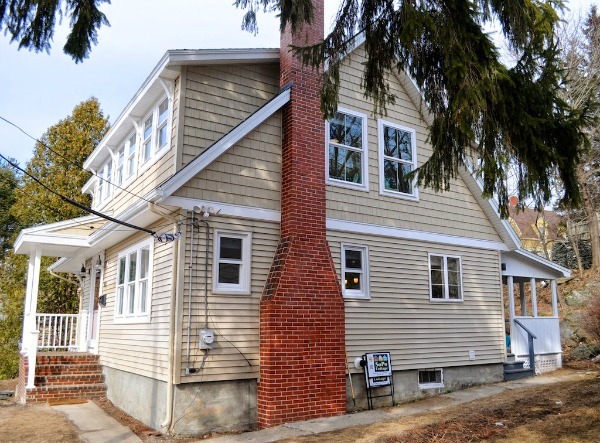 My favorites: that shed dormer + tricking out the bad picture window by turning it into 3 side-by-sides. well clearly i’m partial to capes, and i love what they did with this one. from the outside there is still character-when they are turned into “regular” houses by getting rid of the dormers, i think it takes away the character. I love this transformation!! So airy and beachy! 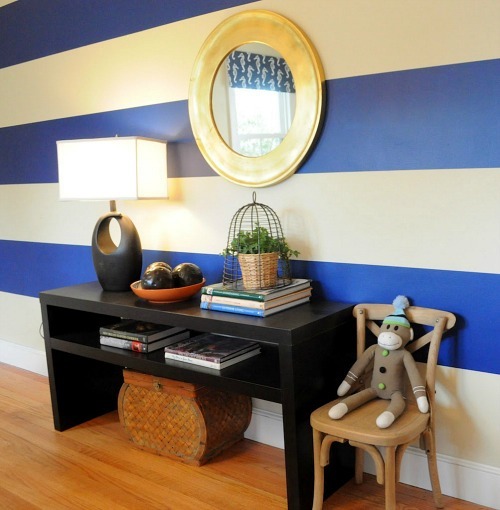 Love the colors, the decorating and absolutely love the phone nook!! 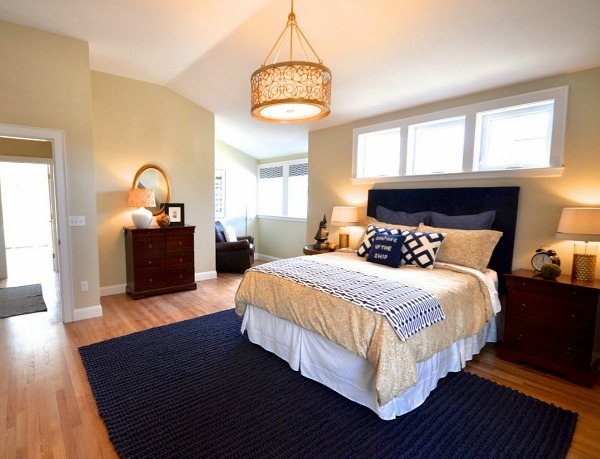 We have a very similar floor plan, and would love to have a “master suite” someday – pinning for future reference! This is a wonderful transformation! 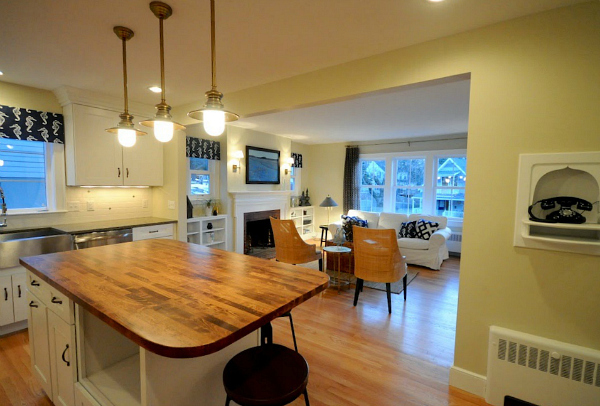 I love the way they stayed true to the roots of the house but turned it into a much more functional space. Two big thumbs up on this one! I just love what they did with that home. So pretty! Now I know what a shed dormer is! Wow! What a spectacular transformation!! Thanks for including that detail about the location near the water. I’d already started to wonder, before I’d read that far, how a person would make the leap to take on a project like that. 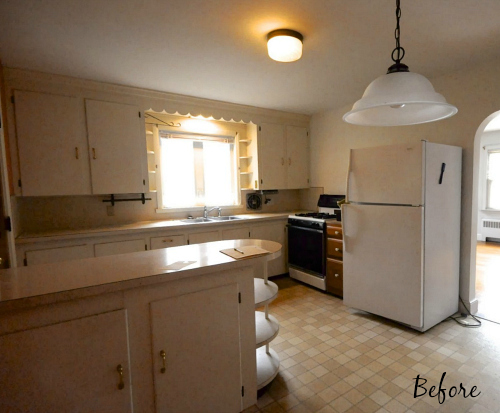 Thanks for these before and afters, Julia. I’m loving it!! Very nice – you’re batting 1000 so far this week! I really like the way the dormer looks on the exterior, and the extra space inside too. The only thing I’d do differently is to keep the kitchen wall where it was. Have been a follower of SoPo for a while now. Re the phone nook, Laurel saved and moved it from a demolished wall AND, in a stroke of brilliance, converted it to a modern charging station! The woman is brilliant! Ha ha….thanks Denise!! Can you tell my husband that? He’s more likely to describe me as crazy!!! A very inspiring transformation! After looking at her before pictures on her site, I saw that the phone nook was on the demolished wall, then read how it was saved and moved to the kitchen. And turning it into a charging station is brilliant. I just love that phone niche. Sometimes it’s the little things. . . The only thing I miss is those arched openings. 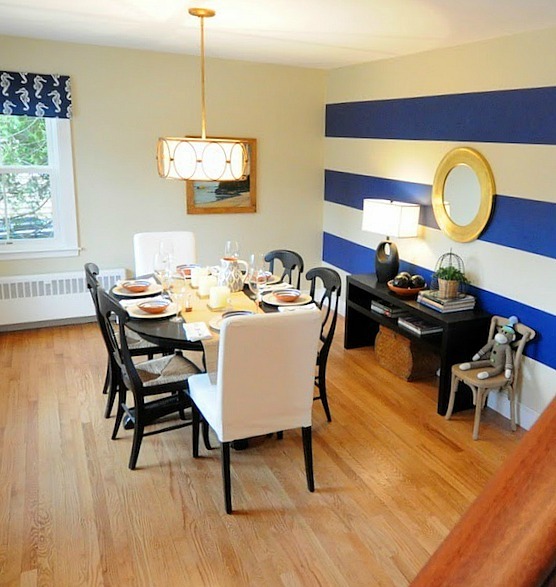 It would have been nice to have re-created those somewhere – maybe by not taking out the entire walls to the dining and kitchen? Hard to do with wide cased openings, I know, but it would still be open, just not totally open. But a terrific job, nonetheless. Thanks so much for all the kind words! And I appreciate that you noticed how the windows changed the house. The old windows were in pretty good shape, but they didn’t give us the look we were going for. So we took them out, donated them to Habitat for Humanity’s ReStore, and installed new ones. A win-win for everyone! Thanks for sharing our story Julia!! The links send me someplace else besides her blog. Does anyone else have that problem? A simply beautiful transformation. I want to see more! Hmmm…they’re working for me. Refresh the page and try again, Patra. Sometimes the links get confused. I had that happen to me on another blog today but when I refreshed her page the links worked the second time. Sorry for the trouble! Unbelievable! I love the shed dormers. I am just finishing blogging about my first house flip in Georgia. I love seeing what others do. I will definitely check out her other transformations. Thanks for sharing. Thank you so much for looking. I will be finishing the last post of the flip this week and showing the new outside. Someone actually accused me of it not being the same house. Haha! Yep! It’s the same house. We have started on the next flip and can’t wait to start blogging about it next week. It’s cute as a button! Thanks for looking again! 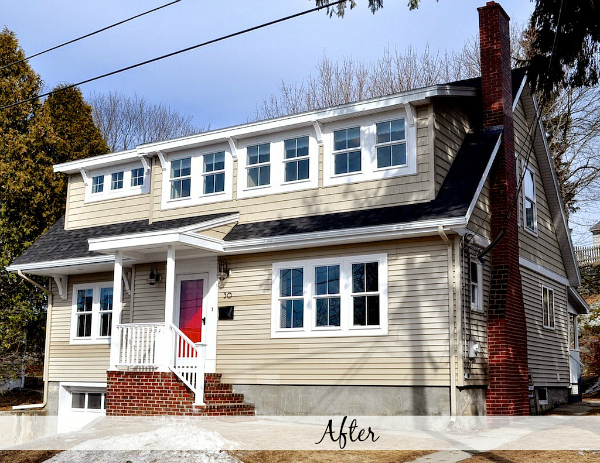 I do understand the need for more room in the house and she did a great job of getting that for the client, but oh how I love the little cape in the before pictures! Keeping the phone nook was a great nod to the house’s past. I bet the owners enjoy the house and location. Thanks for sharing with us, Julia! Beautifully done! I love the charm of this house. 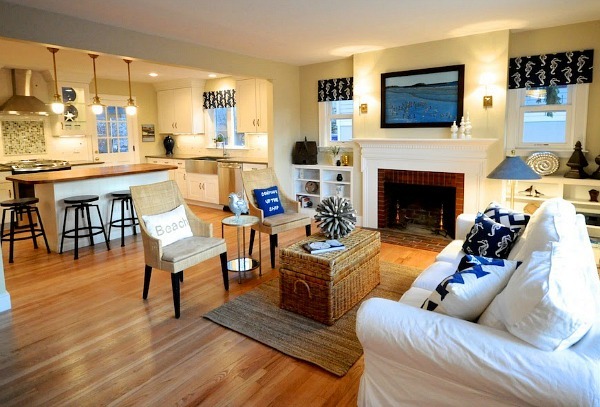 It really does feel like a nice beach house and it makes me wish I lived in a place where it’s summer all year long. Well done! While the house looks wonderful, I’m not as fond of the changes as most of the my fellow readers. The house no longer looks as charming as the original but to me, looks like every other house out there. I know these Capes are small, but that is part of their charm. I would have done just a dormer on the back and maintained the front roof line myself. Overwhelming! I love the shed dormers. A simply beautiful transformation. 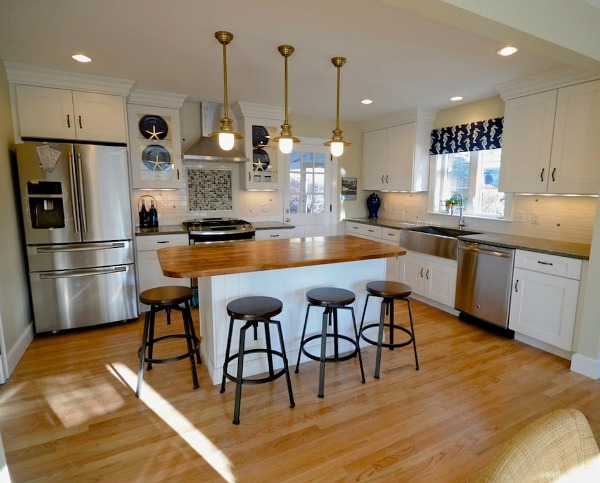 Loved everything about the restoration of this home…perfection! Wow! 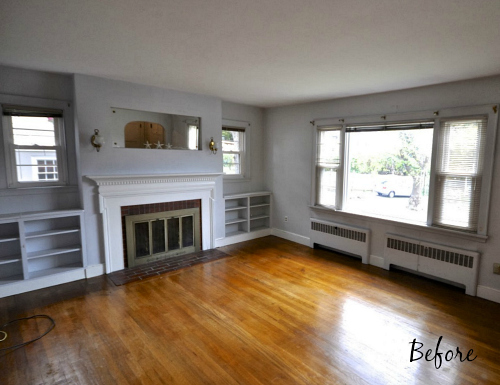 They did an amazing job restoring this house. It ruins the outside. Was beautiful before. Looks top heavy and ugly now. Maybe there’s a reason it was built that way in the first place…..